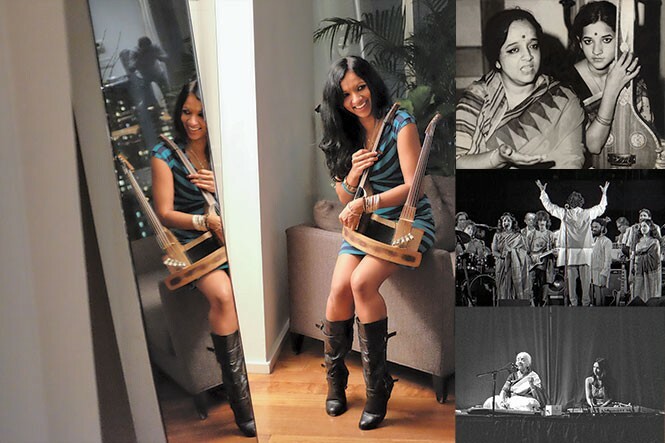 Gingger Shankar reveals hidden female side of her family's musical legacy. Ravi Shankar is often credited with ushering in a unique eastern musical movement within western pop music. From his lauded 1967 performance at the Monterey Pop Festival to his collaborations with George Harrison and the Beatles, the sitar virtuoso became the de facto focal point of western culture's understanding of Indian classical music. But his music was always part of a larger family tradition, including many women who were often relegated to the background despite the size of their contributions. Now his great-niece Gingger Shankar, a composer and virtuoso in her own right (she is the only woman in the world who has mastered the 10-string double violin), is helping reintroduce to the world to two previously unsung members of India's first family of music. "Nobody knows the female side of the story," Shankar says. Her latest project is called Nari, a multimedia performance about Lakshmi Shankar and her daughter Viji Subramaniam (Shankar's grandmother and mother). Throughout their lives, as Ravi Shankar recorded and toured, Lakshmi (his brother's wife) and Viji were there, helping to pioneer an entire musical movement with little to no recognition. In fact, it wasn't until Shankar began going through old scrapbooks, belonging to her now-deceased mother and grandmother, that she herself realized the full extent of what they had accomplished as artists. "Every female voice you hear during that time is theirs," she says. "They were part of this whole scene." The problem, she explains, isn't just that they aren't widely recognized in western music circles; even Indian music fans know little about the women in India's most famous musical family. When Lakshmi died, if her death got any recognition at all, she was identified in local media headlines as Ravi's sister-in-law. As Shankar traveled to India to research for Nari, her encounters with local reporters produced similar results. "I'd say, 'I'm here doing this project about my mother and grandmother' ... and literally the first 50 articles that came out in India all said, 'Gingger is in India filming a documentary about Ravi Shankar.' I remember the first time I saw an article with their names in it. It was like a little victory." Lakshmi and Viji were ultimately victims of a male-centric musical culture that India is still working to overcome. "At the end of the day, you're expected to be a wife and mother," Shankar says. "I think strong women voices need to be heard in India ... which is why this project was propelled. There's a huge need for women's voices there now," she says. The show pays homage to the traditional music of her family, but Shankar, who grew up living between India and Los Angeles, also blends electronic music, hip-hop and an entrancing performance on the rare double violin—one of only two such instruments in existence. "I've always kind of considered myself as a hybrid," she says. "Nari, specifically, has been East-meets-West. I was taking all of my mother's Indian classical recordings, and added a lot of new things to that. I like both languages a lot." Shankar expects to release Nari as an album later this year, but even as she travels around the country performing it, it continues to evolve and grow. Her discovery of her family's hidden legacy grew deeper as she exposed it to more people. The show's U.S. premier was at the Sundance Film Festival earlier this year. Shankar says that, after the show, a security guard told her he had pictures of Lakshmi and Viji that he took when he saw Ravi Shankar perform years ago. "We've been getting so much archival [footage] that we've never seen before," she says. "We had these photos from Toronto in this crazy, big stadium where my grandmother's conducting the orchestra. We'd never seen pictures of that before." It isn't just the voices of her mother and grandmother that she's discovering. In trying to give them a voice, she's discovered one of her own. Shankar's previous work includes classical Indian recordings, film scores and collaborations with pop stars such as Katy Perry and Smashing Pumpkins. Nari, she says, is her most personal work to date. "Which probably makes it the scariest," she adds. Growing up in a musical family, Shankar can't remember a time when she didn't want to make music. But the name she carries could sometimes be a blessing and a curse, she says. "I think for a lot of years, I ran away from the weight of this family name and what this legacy is. ... We're all carving our own paths, but I wouldn't be here if it weren't for the two women before me."